What Gigabyte reports is probably the "Temperature 3" value seen in HWiNFO, which is most probably the value from a sensor near the CPU socket. The "CPU 0" value which is so low, comes from internal CPU sensor. This sensor doesn't work properly in most later AMD CPU generations, which is also acknowledged by AMD. When the temperature is in the lower range (idle, below ~50 C) the sensor provides erratic values. When the temperature gets close to upper limits, the value should be more precise. Unfortunately AMD has not provided any solution for this. (11-17-2013, 01:01 PM)Martin Wrote: What Gigabyte reports is probably the "Temperature 3" value seen in HWiNFO, which is most probably the value from a sensor near the CPU socket. What is that "package" anyway? and also in Speccy, it displays the same temp as what is seen in 'package' but right next to CPU AMD A8-5600K as if that's actually its temp, you think those are right? I believe that "Package" temperature is not correct as well. While sometimes it can provide values which seem reasonable, in other cases I believe it's pretty off the expected values. I'm afraid, this is a hardware problem of the sensor in the CPU and it seems to me that AMD tries to apply various workarounds for this, which don't work properly either. (11-19-2013, 11:30 AM)Martin Wrote: I believe that "Package" temperature is not correct as well. While sometimes it can provide values which seem reasonable, in other cases I believe it's pretty off the expected values. I'm afraid, this is a hardware problem of the sensor in the CPU and it seems to me that AMD tries to apply various workarounds for this, which don't work properly either. where does package from? how does hwmonitor derive it? That value comes from the SB-TSI interface and not even 'HWMonitor' knows exactly where it comes from thru this interface. I could add the same value into HWiNFO, but I believe it might cause even more confusion among users. (11-19-2013, 01:32 PM)Martin Wrote: That value comes from the SB-TSI interface and not even 'HWMonitor' knows exactly where it comes from thru this interface. Where does sb tsi come from? How is it derived? Speccy is most probably using the exactly same method as HWMonitor does. SBI-TS is an AMD proprietary interface that can interconnect various temperature sensors. I was trying to determine which exact value is read there, but this is not well documented/disclosed by AMD. Not even in advanced documents that require an NDA. I also discussed this with Franck (author of CPU-Z and HWMonitor) and he doesn't know either where this value really comes from. Moreover he confirmed that this value is not correct in many cases. (11-19-2013, 03:17 PM)Martin Wrote: Speccy is most probably using the exactly same method as HWMonitor does. Is it true however that when the temp is high enough or under enough load the 14-20 C will become more and more accurate and I will see an accurate value when it's very near 74C(max operating)? Have you tried the high load test for few minutes as I suggested before? Please try that and let me know what "Package" value will be reported then. (11-20-2013, 08:30 AM)Martin Wrote: Have you tried the high load test for few minutes as I suggested before? Please try that and let me know what "Package" value will be reported then. Oh hey by the way someone suggested using GPU-Z and viewing the HD7560D temp and that it it seems to give an accurate temperature reading for the entire chip. I tried it and it shows 44 C right now, different from Package and the 16-20C previously reported. Do you think this could be correct? given I base the a8-5600k APU temp on its GPU using this? 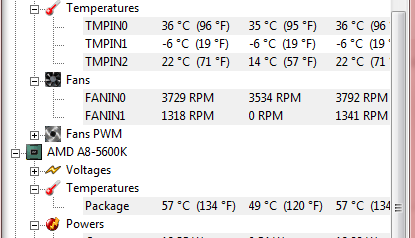 So what Package temperature has been reported after few minutes run with Prime95 ? I'm afraid, but the APU/GPU temperature sensor seems to be providing erratic values in many cases as well. (11-20-2013, 01:58 PM)Martin Wrote: So what Package temperature has been reported after few minutes run with Prime95 ? I already replied to this question above. The new v4.27-2040 Beta released a while ago should display the "Package" temperature too. You might need to press the "Restore Original Order" button in Sensors/Layout for the new item to reordered under particular sensor.